I must admit: I’m not a regular Starbucks customer. When summer rolls around, though, I’m the first one in line at the omnipresent coffee joint. Not for an iced cup of joe or blended coffee drink, but for their delicious Green Tea Lemonade. Green tea is one of my favorite warm drinks and lemonade is one of my favorite coolers. Put the two together and you’ve got one delicious summer sip. 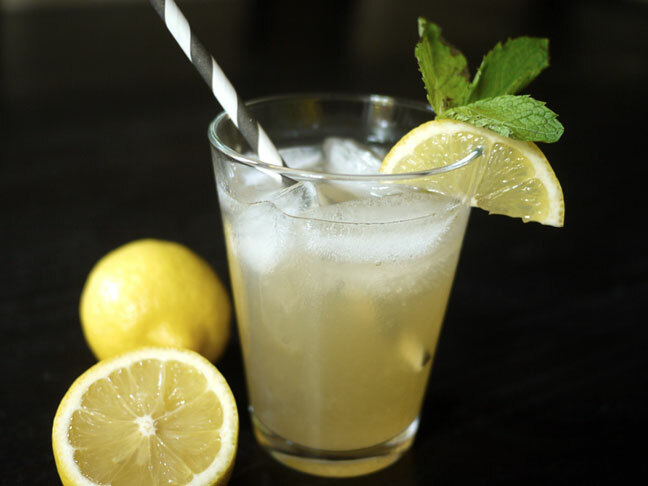 Tart and sweet like a traditional Arnold Palmer, green tea lemonade has a more delicate herb flavor that’s almost minty. Plus, you get a little boost from healthy green tea! My recipe makes two tall servings: one for today and another for tomorrow or the next day. If I want more later in the week, I’ve got to make another batch. It takes just enough work to make me think, but not so much that I can’t whip this up when a craving truly calls. It’s also easy enough to double or triple this recipe for company. Sammys, salad and green tea lemonade—can you think of a better summer lunch party? Whether for a group or a private party of one, Green Tea Lemonade makes any summer meal or snack even more festive. Step 1: Add 3 tablespoons sugar and green tea bag to the boiling water. Allow the tea to steep about 3 minutes or so before discarding the bag. Stir to make sure the sugar has dissolved. Step 2: Add the lemon juice and ¾ cup cold water to the sweetened green tea mixture. Stir to combine well. Taste and if it’s too tart (which is how I make mine), add more sugar to taste. Once you get the right level of sweetness, pour about half of the yield over lots of ice and enjoy. Summer Showdown: Strawberry Lemonade or Watermelon Limeade?Watermelon – Cool, refreshing and totally mashable! !